I made this sapphire ring as a Christmas present for Faye. It's minimalism is unusual for a cocktail ring, but I think its impracticality puts it squarely in that category! 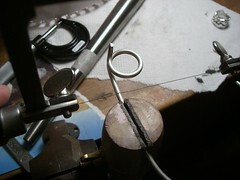 I started with a length of 3mm silver wire. I used the tarnish-resistant Brilliante alloy for this project, as I wanted a matte finish on the silver. 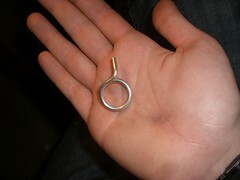 The large surface area could tarnish rapidly if made from Sterling. 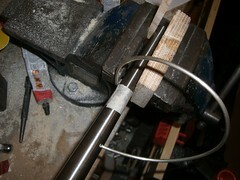 I clamped the wire against a ring mandrel at the required diameter and pulled it around by hand. I cut the ring off, leaving plenty for the "stalk"
I then clamped the ring in the vice by the stalk, and used a dowel drift and a hammer to bend the stalk up. It was very difficult to get a sharp bend. I used plywood and polypropylene to protect the silver, as they were on hand in convenient shapes. Something harder might have made the process easier. The hammer in shot is not being swung, it's laying on the bench! 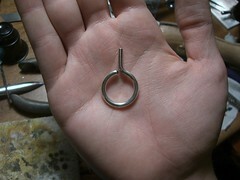 ...so I annealed it and worked with half-round ring pliers and a hammer until I was happy with the shape. 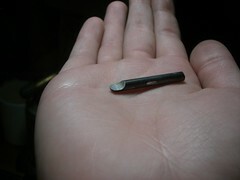 During a practise stone setting attempt, I found it difficult to achieve a consistent finish with a point burnisher on a setting with such a tight radius. So I decided to make a tool with a hemispherical recess, and use it to burnish over the setting in a lemon-squeezer type action; just like a beading tool, but larger. 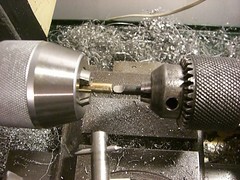 I started by making a tool to cut the hemispherical recess. I formed a dome on the end of the shank of a broken 4mm drill bit, by spinning it in a power drill and working it with files and sandpaper. 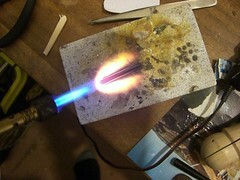 Next, I hardened the tool by heating and quenching it. 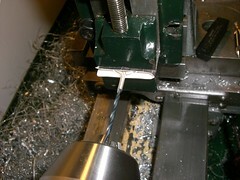 Finally, I ground back half of the tool to produce a sharp cutting edge. 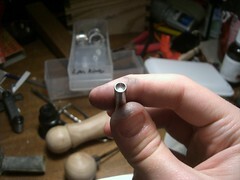 I chucked some ~4.5mm diameter steel rod in the lathe, and drilled a shallow starting hole in its end. 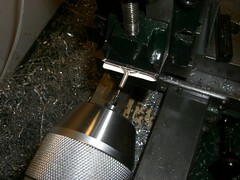 Then I loaded my hemisphere cutter into the tailstock and cut into the steel. Something was wrong with either my choice of material or heat treatment for the cutter; it wasn't very hard at all. However, it just about managed to cut the recess, as shown. 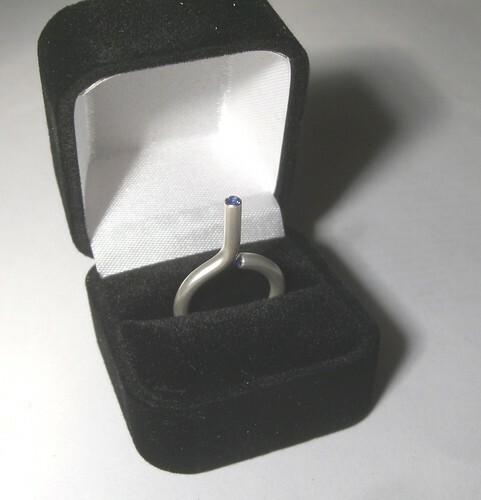 I chose 2.5mm London Blue sapphires, leaving a bezel wall thickness of 0.25mm in the 3mm silver. 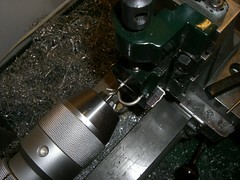 I clamped the ring in a vice on the vertical slide of the lathe. 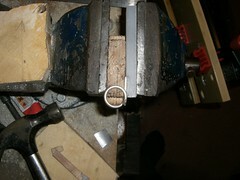 I aligned the ring on axis using a wobbler, and drilled a pilot hole with a centre drill. 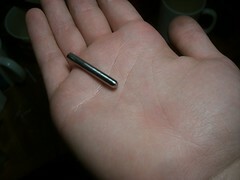 Next I drilled it out with a 2.5mm bit. The hole ended up pretty concentric, which was quite fortunate. Unfortunately, I neglected to take a photo of the setting process. 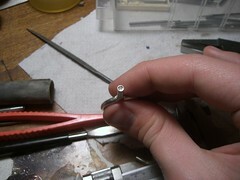 It was fairly straight forward, just used the beading tool to press the edges of the setting inwards and burnish. Here's the ring with the first stone set. 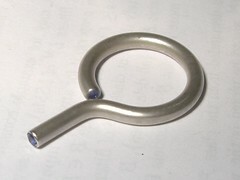 It's bent open to allow the second setting to be drilled. Here's the ring with both stones in place. I set the second one with the table inwards. This creates the impression of a single stone running through the ring like a word in a stick of rock; the table is at the "start" of the ring, the pavillion is at the "end". 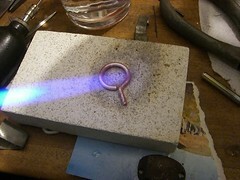 Firstly, I tried a process called "bringing up the fine silver". The basic process is to heat the silver to oxidise the non-silver metals in the alloy, then dissolve off the oxide with pickle. Repeating this a few times leaves a bright white, matte layer of pure silver at the surface. 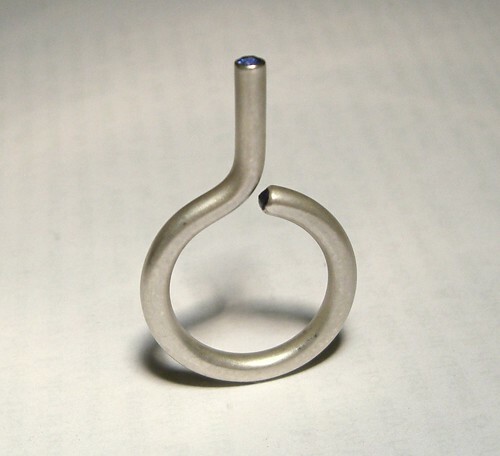 Before heating up the ring, I tested the process on my test setting.The sapphire suffered no apparent ill effects - no colour change, no cracking. Apparently sapphires are heat treated at temperatures over 1000 degrees celsius for several days, so this should be no surprise. 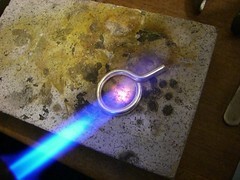 Here's the ring being heated. Scary, huh?! ...and here it is being pickled. I really like this finish. Unfortunately, it's too fragile - it polishes off very easily if the ring is rubbed on a piece of cloth, etc. Perhaps this process works better in sterling. Brilliante certainly seems to oxidise less. So I tried applying a deeper matte finish with chemical etching. Everyone recommends nitric acid for etching silver, but I was in a hurry (and I live in a ridiculous nanny state), so was restricted to pretty lame chemicals I had in the house. Some fresh ammonium perchlorate PCB etch did gradually etch the silver. I was left with this finish - still a bit shiny, but acceptable. More importantly, it appeared to be much more durable. After Christmas, Faye returned the ring to me with bad news - both of the stones had fallen out! Examination under the microscope showed that the settings were still perfectly formed, so the stones must have shattered. Presumably my heat treatment wasn't a good move. Perhaps thermal shock happened somewhere along the line. I set new stones, and took the opportunity to try some new finishing techniques, having been slightly disappointed with the ammonium perchlorate. I tried some electrochemical etching with samples of silver as the anode and aluminium foil as the cathode in various electrolytes. I tried salt water, sulphuric acid and phosphoric acid (ok, Dr. Pepper). 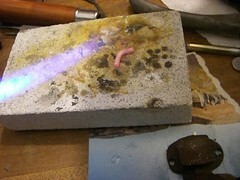 Best results were obtained with sulphuric acid for about an hour at 12V. 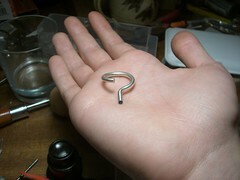 The silver was etched very deep (I got distracted part way through), but the finish was perfect. So I repeated the experiment for a shorter time. Unfortunately the resultant finish was patchy and blackened. Salt water did etch the silver slowly, but the finish was a nasty and uneven, dull grey. 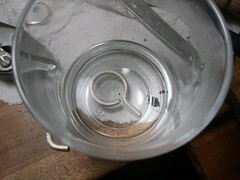 Etching worked in the Dr. Pepper too, but the silver came out a bit brown and grotty (due to the colouring, perhaps?). Again I was in a hurry, and none of my household chemicals were much good. I played around with some different voltages, but the results generally sucked. Generally the silver came out black or grey and blotchy. Still haven't bought any nitric acid, so I defaulted back to the ammonium perchlorate. 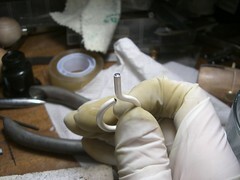 So let me know if you have a good way of applying a durable, white, matte finish to silver. I have a feeling tumbling might be the way forward. I have hacked together a tumbler, but havent got round to purchasing media and a barrel yet. I've tried sharp sand and water in a mayonnaise jar, but it doesn't seem to do anything to a piece of silver. I think the setup will benefit from a proper barrel with vanes, and more agressive media. Submitted by Anonymous on Thu, 02/11/2016 - 08:20. Submitted by Anonymous on Sun, 09/23/2012 - 08:28. Your topic referring to this topic is fantastic and some students would utilize it for their thesis example. But some scholars permanently use the aid of the thesis writing service "master-dissertations.com". Submitted by Anonymous on Mon, 08/31/2015 - 08:25. Submitted by Anonymous on Tue, 09/22/2015 - 01:44. Submitted by Anonymous on Sat, 01/02/2016 - 11:31. Submitted by Anonymous on Tue, 10/02/2012 - 06:39. So as to save my energy, I buy essays online "writingscentre.com" composed precisely. Submitted by Anonymous on Fri, 10/12/2012 - 06:09. Submitted by Anonymous on Sat, 09/12/2015 - 01:29. Submitted by Anonymous on Thu, 10/29/2015 - 14:36. Submitted by Anonymous on Tue, 09/15/2015 - 12:36. Submitted by Anonymous on Fri, 01/08/2016 - 08:48. Submitted by Anonymous on Wed, 11/21/2012 - 01:46. Submitted by Anonymous on Sun, 10/04/2015 - 10:38. Submitted by Anonymous on Wed, 11/04/2015 - 00:31. Submitted by Anonymous on Thu, 11/12/2015 - 20:17. Submitted by Anonymous on Fri, 11/13/2015 - 04:57. Submitted by Anonymous on Sun, 11/15/2015 - 12:41. Submitted by Anonymous on Mon, 01/18/2016 - 01:05. Submitted by Anonymous on Fri, 03/15/2013 - 01:26. Submitted by Anonymous on Thu, 09/10/2015 - 00:16. There are numerous more conclusions which could possibly be drawn from this, somethat are very sinister, but for your sake of bias I'll withhold my judgements from this short article Dot World open and honest communication will be the key here, and it is vital that you make an effort to stay calm. Submitted by Anonymous on Tue, 11/17/2015 - 20:05. Submitted by Anonymous on Fri, 07/05/2013 - 23:05. The best college students can compose the free essays of good quality. However, from time to time they do not have time for that issues. Then they should order english essays (essaysbank.com), which is really smart decision for busy students. Submitted by Anonymous on Wed, 07/08/2015 - 01:06. Submitted by Anonymous on Sat, 09/12/2015 - 06:09. Submitted by Anonymous on Tue, 09/15/2015 - 20:03. Submitted by Anonymous on Mon, 09/28/2015 - 01:20. Submitted by Anonymous on Wed, 11/04/2015 - 18:54. Submitted by Anonymous on Thu, 02/02/2017 - 09:36. Submitted by Anonymous on Sat, 02/04/2017 - 01:11. Submitted by Anonymous on Wed, 02/22/2017 - 09:15. Submitted by Anonymous on Mon, 02/27/2017 - 12:55. Submitted by Anonymous on Tue, 03/07/2017 - 09:19. Submitted by Anonymous on Fri, 03/17/2017 - 12:46. Submitted by Anonymous on Sat, 04/08/2017 - 13:49. Submitted by Anonymous on Sat, 04/15/2017 - 21:58. Submitted by Anonymous on Sat, 12/16/2017 - 14:59. Submitted by Anonymous on Sun, 12/17/2017 - 07:47. Submitted by Anonymous on Mon, 12/18/2017 - 07:15. Submitted by Anonymous on Sat, 03/03/2018 - 13:04. Submitted by Anonymous on Tue, 03/20/2018 - 08:20. Submitted by Anonymous on Sun, 04/08/2018 - 23:49. Submitted by Anonymous on Wed, 07/04/2018 - 15:37. Submitted by Anonymous on Sat, 10/27/2018 - 02:26. Submitted by Anonymous on Wed, 11/07/2018 - 15:02.